Last night, apparently part of the ceiling collapsed at the 181 St station on the (1) New York City Subway line, causing debris to fall onto the tracks. This is causing all manner of mad craziness this morning. I took the Bx10 to the Bx7 to the (A). Bad news for residents of Van Cortlandt Park, Riverdale, Spuyten Duyvil, Kingsbridge, Inwood, and Washington Heights, though the latter two have the (A) train to make up for it. Then in my station in midtown, I heard the much lauded “Dedicated Announcer” announce that there was shuttle bus service between 242 St and 168 St (making all stops), and that all (1) trains running between 242 St and Dyckman St would be running express. Express???? 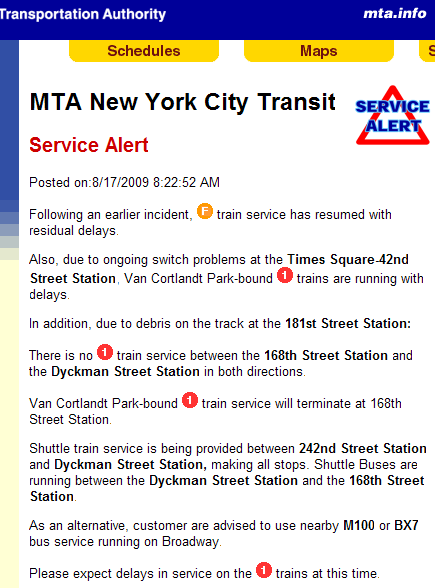 This entry was posted on Monday, August 17th, 2009 at 8:32 am	and is filed under delays, safety, service alert, subway. You can follow any responses to this entry through the RSS 2.0 feed. You can leave a response, or trackback from your own site.